Nora Armani plays Shakespeare, Shaw, Hammerstein, Molière, Tchekov, Guitry, Labiche, Fatima Gallaire, Tewfik al Hakim, Gunter Grass, and has toured with SOJOURN AT ARARAT internationally in over 20 cities on four continents in its English and French (Le Chant D’Ararat) versions, together with Gerald Papasian. Nora Armani has interpreted lead roles in American, French, Czech, Armenian, Lebanese and Egyptian films on screen and on television. Between March 1991 and December 1993, she represented the Ministry of Culture of Armenia as a spokesperson for the promotion of Armenian cinema world wide. The films she has produced were shown at major film festivals: Cannes 1996 (Official Selection- Un Certain Regard), Montreal, Rotterdam, Cairo, Portland, Washington, D.C., Cambridge, London, Inverness, Cardiff, Birmingham and Lancaster amongst others. She was invited to Cairo to play the lead role of Anna in the musical The King and I opposite Egyptian stage and TV star Mohamed Sobhi, performed at Radio Theatre in Cairo and broadcast on TV and Satellite. Other works: “Nannto Nannto”, a stage production of words and music of her co-creation with cellist Aya Sakakibara, which she performed in Paris at the Theatre des Dechargeurs during February 2000. And later in Venice at the Santa Margherita Theatre in August 2000. Nora Armani is the winner of several awards: two BEST ACTRESS awards for Film and Stage Yerevan (Armenia) Festival-1991, the DRAMALOGUE AWARD for performance-1988- Los Angeles, the Encore DRAMALOGUE AWARD for performance-1989- Los Angeles, the CALIFORNIA MOTION PICTURE GOLDEN STAR award-1985-Los Angeles. She is an Honorary Member of the National Theatre of Armenia since 1992. Her most recent award was that of Best Actress for her lead role in Labyrinth at the Siunik Film Festival. She holds an M.Sc. from the University of London and a B.A in Sociology and Theatre Acting and Directing from the American University Cairo and UCLA. 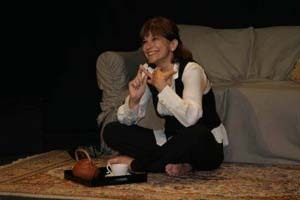 Her most recent work as a playwrigt and performer is On the Couch with Nora Armani and her recent TV appearance is the TV series Freinds in Egypt. My characteristic traits are engraved on my birth certificate and my passport! As far as I know, I’m the only one in this category. A female, born in Egypt of Western Armenian parents, educated in England, having lived primarily in the USA and in France, with shorter visits to a host of countries which we won’t go into, fluent in several languages, two of which are mother tongues, plus a host of special physical attributes… I think. I hope! Oh, but maybe I don’t have to [wait much longer]…Things have changed dramatically over the past few years. Nowadays ethnic is in! You see it in all the major… supermarket chains. It’s all there, on special shelves. ‘Ethnic Delights’! So, tonight, ethnic delights! This [casting] call is for a romantic, curious, charitable, headstrong, sheltered, kaleidoscopic and exotic, not to say ethnic, brunette 20-25 years of age (ah well, we’ll make an abstraction of that – most casting calls are for under 25’s anyway!) of medium height and build, deep brown eyes and a huge smile with a ‘please like me’ expression. She must speak several languages though none are really needed. She must have lived in different countries even though the action takes place right here. And most importantly, she must sing and dance well, as it will be needed in the course of the evening’s entertainment. It’s incredible. It’s me! Fits like a glove! I can assure you by the end of this evening you’ll have, before you, a very happy and satisfied artiste. If there is such a thing! So, without further ado, let’s hold hands and leap into the wonderful world of… Nora Armani! (Recognising someone in the audience). I can’t believe it. It’s you. I wasn’t sure. I thought I was imagining it. The hair, it’s the hair that fooled me for a second. But eyes never lie. It sure is you. (To the audience). Please excuse me. You are witnessing an incredible moment. (To the person) I knew we’d meet one day. But here, tonight…! I’d even imagined all sorts of situations – except this one. How long has it been now? Fifteen years. You haven’t changed at all! (To everyone) Where was I? Ah, yes! (To the audience) You know, this woman looked so much like me. The spitting image! It made me want to spit. (To him) Where did you find her? Oh, yes, she found you. (Does a posh accent) Picked you up at a posh party chez… what’s his face! Oh, never mind! Excellent place for that encounter, and quite safe too. (Back to her normal accent) She turned to be my ‘replacement’. She had the right family background and all the contacts. Not that you needed them! (To herself) I, on my end, don’t know much of my pedigree (to the audience) except that my great-grandfather came from Erzeroum, in Anatolia. It’s Eastern Turkey now. He travelled West as a young man, to Istanbul, in search of fame and fortune. Neither of which he found …until now. “The excruciating desire to belong somewhere is a curable disease,” I thought to myself and set off to find the remedy. It verged on obsession. At first unconsciously, then on purpose, I looked for the remedy in others; other people. Men. (Glancing over her shoulder to him) Yes, mostly men. They can be a good remedy! My first man, I’ll call him… Adam. The rest will follow alphabetically. Let me see. (Starts reciting the Armenian alphabet) AYP, Pen, Kim, Ta, Yetch…. I think we’d better stick to the Latin alphabet. The Armenian Alphabet has 38 letters, with doubles for each. Twins! The Arabic alphabet is all struck together. Can’t tell where one ends and where the other begins. You’ll have a very bad opinion of me. Hebrew is from right to left. I’d like to think in these matters there’s no right or left. Maybe top or bottom. Like Chinese. Oh, no! Chinese has 10,000 characters. Impossible to do in the course of a lifetime, let alone an evening! O, I almost forgot the Hieroglyphs. Then again, maybe not. It can get too graphic!